Thanks for putting up with my annoying dad while you were working, and thank you for letting me get a picture with you, and for signing my autograph book. I love your videos that you do. You taught us a lot! Your make video on the mini fire cannon was awesome! And the funny diaper gel gag was funny too, but not that awful chocolate joke.. Ewww! Thanks again for helping make my Maker Faire great!! Submitted by Sylvia on Fri, 07/03/2009 - 10:19pm. My dad is working on that! 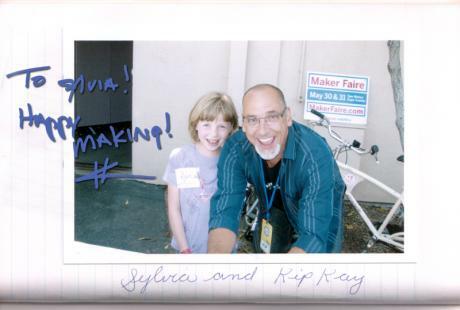 I hope to meet you again too, we want to go to next years Maker Faire, it will be even better I bet! I'll have to catch up on some of your videos until then! Thanks again for commenting and everything!! Submitted by kipkay (not verified) on Fri, 07/03/2009 - 6:50am.